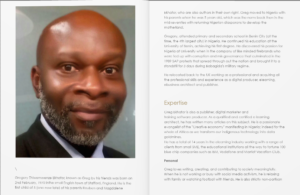 Perhaps more than anywhere in the world; in Nigeria, there is a shortage of basic skill-sets for industry, in almost all aspects. The government can’t do it all, even if Nigerians are incorruptible. A database of talented best of the best potential employees when needed for business. Above all they get the best contracts from governments home and abroad because they know of their intiatives and capacity building! As an extra, if you are interested in politics, it is a sure banker to win peoples trust and support for obvious reasons! It is best discussed by inbox in the first instance, to know what kind of training you are passionate about Nigerians getting? Over the festive season i was in Nigeria. As part of my trip i did some intense consulting for a client on setting up a sponsored training program in a specific area. To my great surprise there were so many specific areas, with similar challenges. Most entrepreneurs automatically interpret challenges to be ripe opportunites. Opportunity to problem solve for long term gain. For instance right now, some very savvy entrepreneurs with capital are investing a great deal in SOLAR POWER, and this is bringing down the cost of generating solar electricity and spurring commerce and industry startups. However the skillsets are still short in many areas, so business start ups are faced with the cost of getting expatriates!!! 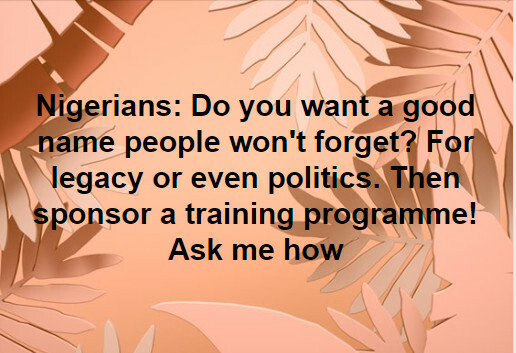 If you are interested in sponsoring training courses, to incrementally solve our problems/ seize our opportuniuties, for the greater good of Nigeria and for your own legacy, then send an email to sponsortraining@debonairtraining.com stating what area of training you are passionate about, what industry you are in at the moment and your plans regarding “Sponsored Training courses”?